This insulation is arguably the most dense of expensive segment of the foams PPP. More resistant to moisture and not much better thermal conductivity than the brand PPP 13 GOST. This brand is more in demand among professional builders. 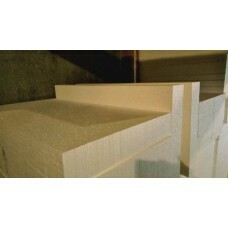 The density of polystyrene foam allows it to be used with a low load. This insulation is used for thermal and sound insulation of the walls from the outside, the liner inside the walls (for example, between the main wall and the cladding). Warm attic and interstory floors, attics, floors (between the support logs), outbuildings and cabins, walls inside the premises. PPS 14 GOST can be used for insulation of facades, but we still recommend to buy a more suitable brand of facade foam. Products for heat insulation of the facade you will find in the catalogue under the names of the PPS 14 f, 15 f of PPS and PPS 16 F.
It will not be easy to distinguish it from the PPP 13 GOST, however, this brand has a small margin of safety and a little less heat conduction. In our case, all brands, as well as expanded polystyrene of brand 14, are made of high quality raw materials on the German equipment, so you can be sure of the quality of products and long service life of such foam. Perhaps the answers to your questions about the features of polystyrene you will find in this article, which covers the material from a scientific point of view. If necessary, you can cut the foam with a knife along a flat rail or saw with a hacksaw. Do you need non-standard sizes of plates? Contact us and we will try to fulfill the order in the desired size of the plates. Foam with foam can be bonded with vinyl acetate glue, and for brick and concrete offer a special glue that can be bought here. Seal the joints and split the tiles conveniently with polyurethane foam. For fastening to a tree such fixture approaches, and to mineral bases it is possible to fix by means of special dowels. price per piece 220 rubles. price per piece 214 rubles. price per piece 205 rubles. price per piece 202 rubles. price per piece 440 rubles. price per piece 428 rubles. price per piece 410 rubles. price per piece 404 rubles. Density 14 kg/m3 thermal Conductivity 0,040 W/(m*K) Size of slabs: 4000х1000, 2000Х1000, 1000x1000, 1000х600,1000h500mm at a thickness of from 25 to 600mm.